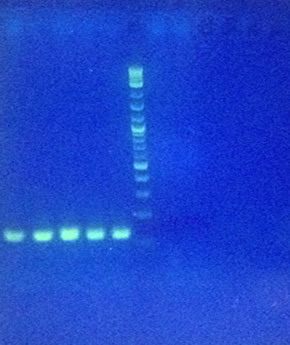 We successfully produced melittin in our E. coli from honeybee DNA! We were able to build and test our biosensor with our mCherry fluorescence marker! Check out our Biobricks here and here! We used a GST plasmid (GST-C-His +) so that melittin could remain in its inactive form when attached to the GST tag. A TEV cleavage site was included in between the GST protein and the melittin peptide sequence so that upon exogenous addition of TEV protease, melittin will be cleaved from GST, thus activating the protein. 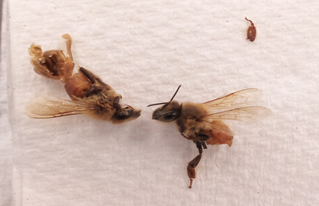 In order to find the gene within the originating organism, we obtained samples of Apis mellifera, amd performed an RNA extraction of the venom gland of the honeybee. After using reverse transcriptase to get the cDNA library, we used PCR to search the cDNA library for prepromelittin precursor to melittin. 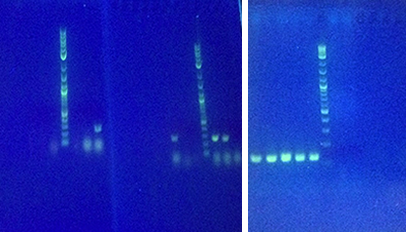 After multiple cDNA searches, we found the correct sized band for prepromelittin for 4 out of 6 of our samples. Once we saw we had the correct ~253 band of prepromelittin, we performed a gel extraction and used the DNA for another PCR. We used this second PCR to add the TEV cleavage site sequence and amplify out the melittin portion, excluding the pre- and pro- precursor sequences. Once we saw the correct band of ~100, we were ready to ligate our insert into the digested GST plasmid. 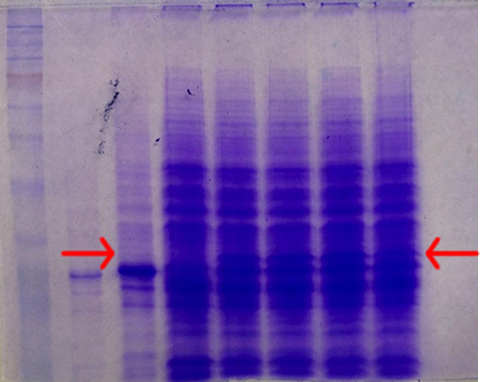 Next, we wanted to induce our system with IPTG lac promoter to see if we could produce melittin, and so we grew out a culture, induced it, and performed SDS page alongside just the original GST plasmid to see if a size of ~30kDa would show up on the gel, which it did! 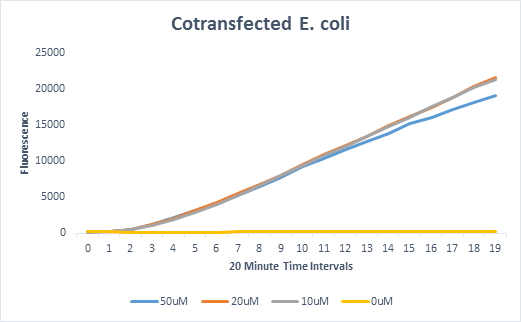 E. coli before and after the addition of melittin solution in an "x" shape. The initial testing of the 2011 Northwestern construct. 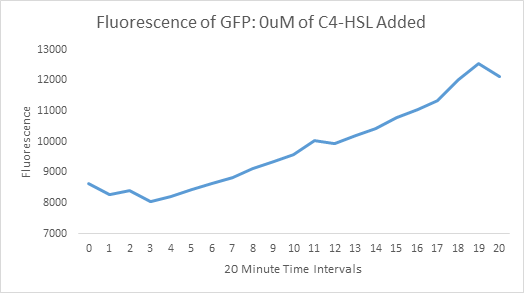 50uM of C4-HSL was added along with a negative control and GFP fluorescence was tracked over a period of seven hours. 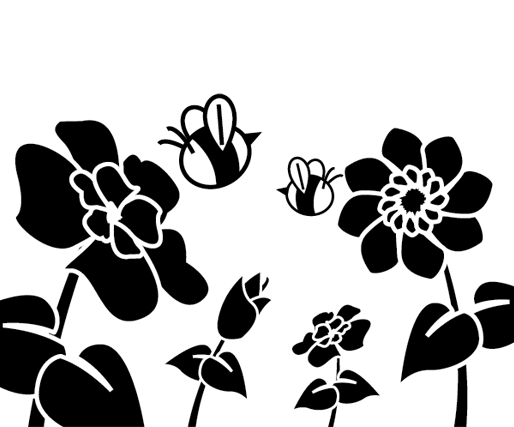 The A and B refer to two separate colonies that were picked off the plate. Everything worked as expected during log phase. However, once the negative control began approaching saturation, it began expressing GFP indicating that it may actually be a leaky promoter. This is useful to know so that once our system is complete, we know that we need to have the cells in log or lag phase to avoid false positives. 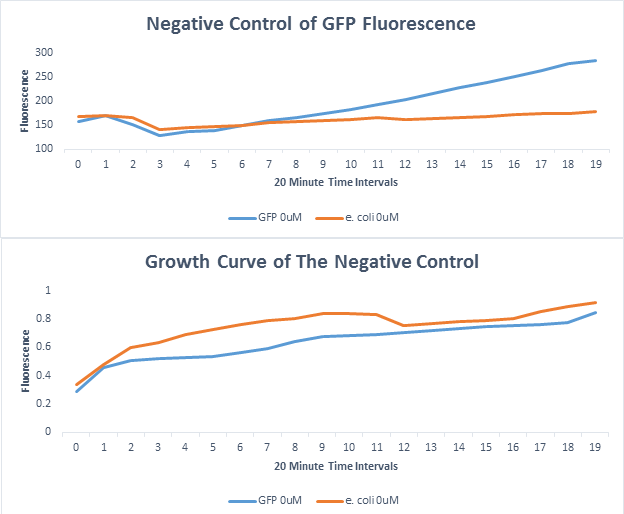 This growth curve is showing that fluorescence is being detected in the presence of C4-HSL when the cells are in log phase. 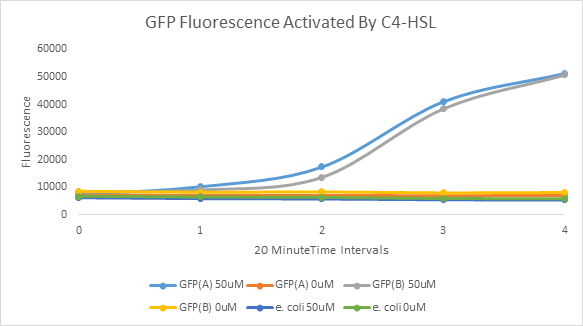 However, it is also showing that the cells which did not receive the C4-HSL treatment are expressing GFP when they reach saturation. This graph is showing that our cells are responding to the C4-HSL treatment. These cells were cotransfected with two plasmids. One plasmid has the Rhl promoter with mCherry acting as a reporter. The otherplasmid has our RhlR protein generator constitutively expressed. The Northwestern was tested once again and we still saw the same results: GFP was expressed once cells reached saturation. Despite the low level of expression, it can still lead to false positives in the future. To test to see if the Rhl promoter is in fact a leaky promoter, cells were transfected with plasmids containing just the Rhl promoter and mCherry. 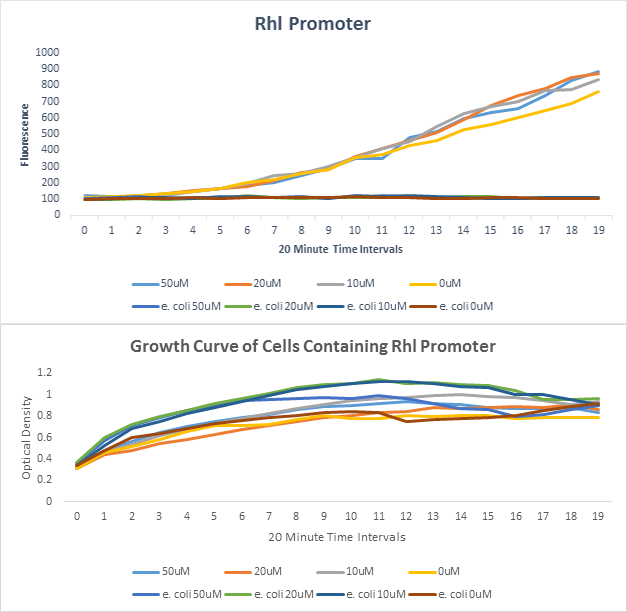 The results show that once cells reach saturation, fluorescence is detected, suggesting that Rhl is in fact a leaky promoter.